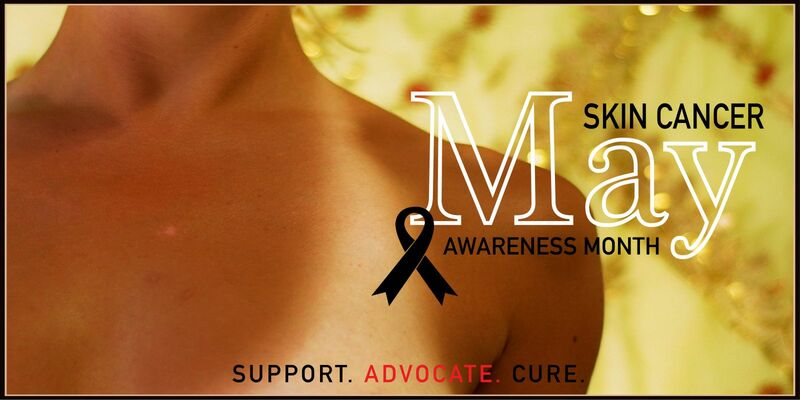 May marks an important awareness month: Skin Cancer Awareness Month. Over 5 million Americans are diagnosed with skin cancer every year, making it the most prominent cancer in the United States. The American Academy of Dermatology has dedicated all of May to raising awareness of about skin cancer, its warnings, and how to check for it as we move into the sunny summer months. Educating the American people about skin cancer first became an idea in 1984 when the AAD created National Melanoma Monday. In short, melanoma is the deadliest and most aggressive form of skin cancer where the cells within moles on the skin become cancerous and spread rapidly to other parts of the body if left untreated. Melanoma accounts for about 75% of all skin cancer fatalities. These cancerous formations can develop in areas all over the body such as eyes, underneath nails, inside the nose and mouth, and more. For this reason, the AAD knew it was time to start spreading information about Melanoma and all types of skin cancer. There are many risk factors that can ultimately lead to malignant/cancerous forms of skin cancer. For example, UV light exposure, either from the sun or from tanning beds, fair-skinned individuals (mainly with hazel or blue eyes), and people with blonde or red hair are particularly vulnerable. Additionally, a chronically suppressed immune system from diseases such as HIV/AIDS, people who have a history of skin cancer, and elderly people. -Develop into a painless ulcer. Also, because Melanoma skin cancer is so deadly, everyone needs to know in terms of Melanoma and skin checks, is what to look for. Dermatologists have been able to create a helpful acronym for the warning signs you need to pay attention to: ABCDE. A: Asymmetry - is the mole asymmetrical? If you drew a line down the middle of the mole, would the two halves match? If not, seek medical assistance. C: Color - is the mole all one color? If there are varying colors or shades of colors within the mole, this could be a warning sign. E: Evolving - If the mole has changed size, color, or shape, that could be a sign. Additionally, if there are other changes such as bleeding, itching, or pus, it could be cancerous. If you are careful and paying attention to your skin and looking for the ABCDE warning signs or any general skin cancer symptoms, you are doing yourself a big favor. Early detection is crucial for treatment success and survival. The earlier a mole is caught, the less it can spread throughout the body, and hopefully it can be removed easily and painlessly. The more the melanoma grows and spreads, the more limited the treatment options are the lower the survival rate becomes. As a business that bases itself on health and wellness, we at Elements Massage want to make sure you are taking the best possible care of yourself. We want to help the AAD in educating people on Skin Cancer Awareness Month. Do a self-check, make a dermatologist appointment, share your story if you've had skin cancer before, etc. For more information Skin Cancer Awareness Month visit the American Academy of Dermatology website at: https://www.aad.org. And don’t forget to continue your wellness inside and out by scheduling your massage therapy by calling the studio or booking online!